The new year has brought another exciting project to Historic New England’s conservation lab. 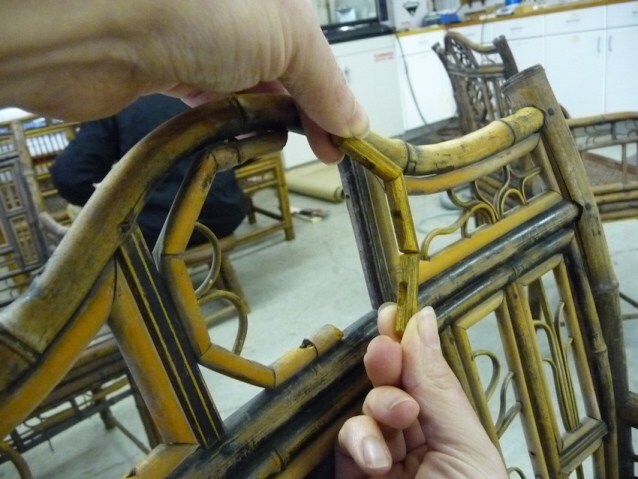 An early nineteenth-century Chinese “made for export” bamboo, rattan, and cane settee and set of chairs have come into the conservation lab for analysis and treatment. Years of light and water damage have not been kind to these objects, resulting in an uneven appearance and missing design elements. 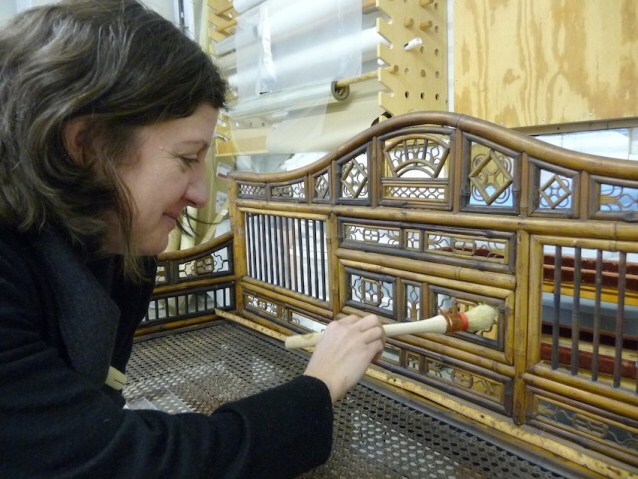 As part of a treatment, conservators typically investigate traditional methods of manufacturing, since knowing how the object was made and what materials were used will guide us in the complex decision-making, repair, and stabilization process. An interesting fact about the construction of the bamboo and rattan furniture is that it was done without the use of adhesives. When we are securing the loose original elements and fitting the replacement pieces, we are following the same method, using wooden pegs, tight fits, and exact shapes. The curvilinear elements were originally formed by soaking the rattan and then placing them around a shaping form. We will use the same method with our replacement pieces. All of this work is being done not only to secure, stabilize, and preserve this suite of furniture, but also to prepare it for display. Visitors can see the settee and chairs at Quincy House in Quincy, Massachusetts, this summer.